They are an effective deterrent against crime as criminals do not want to be identified and they signal a home owner that takes security seriously, that would probably have other counter measures inside. They can give you peace of mind by allowing you to look in on your home remotely to make sure that everything is OK. They can also alert you of motion detected at the home. Most commonly these cameras would detect a car in the driveway or a person at the from door and then notify you and send you a video clip. There are three common types of camera systems being deployed in homes today. The first is the video intercom/doorbell. 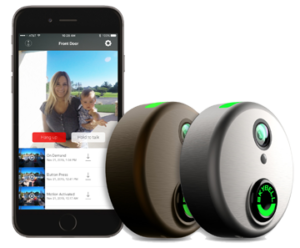 It notifies you when there is motion at your door or when your doorbell rings and then gives you the ability to answer the door with a smart phone app from anywhere. The second is a cloud based camera that has the ability to be placed about anywhere that has Wi-Fi access and can notify you when motion is detected or allows you to view it live at any time. Finally is the full DVR/NVR based system that usually consists of 3 or more cameras and a recorder that can store weeks or months worth of video for viewing later. From a price perspective, the doorbell cameras cost around $250 installed and the cloud based camera costs around $200 installed, while the DVR based systems are usually over $1000 installed. In later discussions, I will talk about the various formats and technologies of today’s mega-pixel camera systems.